I don’t know for sure what holidays are like at your house, but if they resemble holidays at my house, and most houses in the US, women do almost all of the holiday preparation: decorating, gift buying and wrapping, invitations, neighborhood and church activities, cooking, cooking, more cooking, and cleaning. Holidays are moments in the year when women, specifically, have extra responsibilities. I distinctly remember my own beloved stepmother telling me — stress making her voice taut — that she just wanted everyone to have a nice Thanksgiving. She would work herself silly to do and have all the right things so that everyone else would have a good time. Multiple this by 10 at Christmas. Alone with the responsibility of making a holiday for everyone else, the woman manages to mobilize technology and goods from BB&B to make it happen. 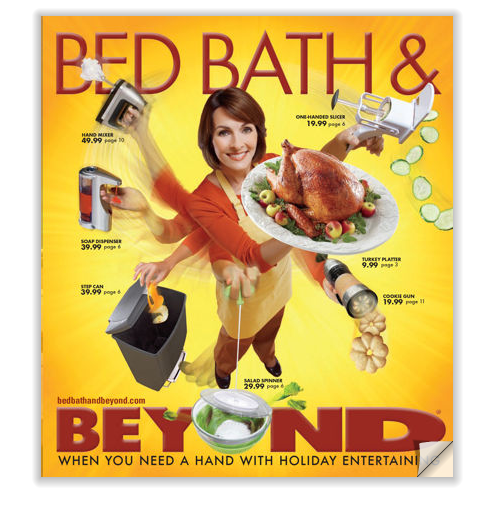 Ironically, the text reads: “When you need a hand with holiday entertaining,” but actual human help in the form of hands is absent. Apparently it’s easier for women to grow five extra arms than it is to get kids and adult men to pitch in. Anyhoo, be a peach and give your mom a hand this holiday season. Not only does this illustrate the sheer amount of work that women end up doing, it has also culturally appropriated and decontextualized Hindu goddesses for the purpose of a housewares ad. This weekend the majority of my neighbours will be celebrating Eid-ul-Adha. Guess who will be cooking cleaning etc? What really got me about this picture is that, despite the obviously frantic graphic -- this woman is thrilled! She is beaming. (I'll ignore the fact that not a strand of hair is out of place and her makeup's done.) She's doing all the cooking and the cleaning, with approximately 3.5 times the ability of a normal person (I count 7 arms), and she's loving that. I've wondered why women just don't say no. But I guess they worried that they'll be blamed for the lousy Thanksgiving, Christmas, etc. Wow, doesn't that look like fun. Poor lady has a thousand-yard stare. I probably would too if I had to do as much work as they're implying by myself. Yeek. Yet another reason to never go to the creepy conformity warehouse of BBB. I'm glad that isn't how it works in my house. Sure, my sister in law and I are going to be the ones cooking, but our husbands are going to clean up after us. I don't think I would ever want to part of a "nuclear family" just the two parents and offspring. When you have more adults under the same roof, everyone has less work. Our holidays are as much about sharing the experience of creating the food as consuming it. There are two things going hand-in-hand here - (1) the advent of technological products that make household chores faster, and (2) the idea that "moms" have to be more and more perfect. That salad spinner saves you 10 seconds on making a fresh salad? Spend it learning to wrap the perfect present. Got that Deluxe Automatic Present Wrapper for Mother's Day? Better make one-of-a-kind, handcrafted Holiday Cards this year! My wife and I both regard cooking as an important creative expression. But I also regard the turkey as _mine_. And one must be a dictator if one wishes to ensure a perfect turkey on Thanksgiving. Out of my kitchen! You can all come make your little casseroles out of canned peas and what have you once the bird is cooked and resting in the insulated bag. I wonder how many extra responsibilities people bring upon themselves though? I'm living on my own in paid company accommodation and recently a co-worker was directed to share-house with me for two weeks. I came home once to find her elbow deep in pink gloves scrubbing the bath, toilet, sink and stove spotless. If I'd known they were a problem I would've done them myself, but my own standards are obviously lower than hers. Whilst I was grateful I didn't ask for it either - and for me to feel I'm now in her debt over something I wouldn't do for myself is a tad bizarre. If we were sharing more permanently I'd have to maintain her standards in spite of my own - and splitting the work isn't necessarily fair because I care far less for what it achieves. And that's what I feel about these holiday frenzies. It's clear that the women in my family take more of the work, but nobody's asked them to either. The male side of the family would rather they just do less and enjoy themselves instead. It won't kill us to order take-out or use less-than-sparkling facilities. We know what houses are usually like. It doesn't have to be a performance. Which reminds me of a graph you posted recently about the sharing of housework that implied feminists do less than their non-feminist counterparts, whilst men are pretty static across the board (and lowest on both counts). Somebody joked that feminists and bachelors must live in dirtier conditions. Well, they probably do - but more importantly, they would know better than to judge each other by it. Maybe it's Thanksgiving, or the ad itself, but it's funny how this conversation got centered around cooking which is usually one of the more preferred household tasks. As men take on more household responsibilities it tends to be the more fun ones like cooking or grocery shopping rather than cleaning. Women still get stuck with the gross jobs. And cooking can also be seen as masculine. There is a glass ceiling in the world of professional chefs. I'd like to take another jab at gender-relegated activites during Thanksgiving...why are there so many football games going on this day? It bothers me to no end that not only do many men not participate in the preparation of the meal, they are given an extra excuse by those who schedule important football games on this day (which we have off supposedly to spend it with family(even female family)). How many women who actually like football end up missing those games because they are expected to be in the kitchen? I'm happy I married a man who doesn't care about football and is happily taking cooking orders from my mom alongside me today. Oh man. I do a ton of crap for the holidays. For years, my husband was not interested in any of it. Then one year I was hospitalized with appendicitis on Thanksgiving and we had no feast, no family visiting, and no leftovers. On Christmas that year and every holiday afterward, he began asking in advance what he needs to do to help me out. LOL, he said missing out on my cooking was enough to make him realize that I needed a hand... I should have gotten take out for Thanksgiving years ago! I find an interesting split in the holiday festivities at my in-laws' house (where we normally spend the holidays). The older woman (mother-in-law) does the majority of the work, with ample help from the children (all adults), both male and female. However, the older males *don't* help. It seems like a generational split to me, where the older males are accustomed to not helping and so don't. The younger males, in contrast, feel more expectation to help and so do. My wife and I have hosted Thanksgiving every year since 1986. She runs it and virtually dictates the extent of my involvement. She is the boss of Thanksgiving and sees its success as hers to achieve. I put out the crudites/dips, make the potatoes, squash dishes, brussel sprouts etc., set the table, clear the table, wash the dishes, make the goodie-bags for family requiring take-home and take out the garbage. I usually make Thanksgiving Soup from the leftovers. I am thankful for my wife!